I AND ABOUT a dozen other passengers watched as the security guard practised swings with his side-handled baton. He was standing behind the check-in desk for the 12:05 Sichuan Airlines flight from Lijang, Yunnan Province, to Xi’an, Shaanxi Province. As each person or family got called up to the desk, his baton swished through the air. Next person, please (swish swish). Did you pack this bag yourself sir? Swishswish. Just the one bag sir? Swishswish-SWISH. Can I break your kneecaps sir? What was that? Can I have your passport sir? Oh….. It was March, earlier this year, just after the terrorist attack on Kunming station where 29 people were killed by Xingjiang separatists, and we were leaving Yunnan province to visit the tourist heartland of China: Xi’an, Beijing and Shanghai. We’d already seen police in fatigues with automatic weapons marching through the airport in lines and executing smart pivot turns at right angles. As I checked in I tried not to think about them executing me. When I reached security and handed over my passport, the rather severe looking lady behind the desk gave me the stare of Chinese officialdom, the one that makes US immigration officials look like kittens. She examined my passport for some time, flicking between my visa and my personal details. She looked up at me, and then she called over someone else. There was a brief discussion, more glancing upwards, and then a third official was called over. Eventually, my passport was handed back, and I was waved on. There was no explanation. Right until I boarded the plane, I kept expecting to be lead into a little room with swishswish man. The problem, I later discovered, was a hyphen. When we got married BK-C and I double barrelled our names: my name on my passport is Knight-Croft. Unfortunately, Chinese systems – for trains, planes, visas, or anything else official you might need to do – only allow your name to be composed of alphabetical characters. So while my passport said Knight-Croft, my visa and my boarding pass said Knightcroft. I read a newspaper article in a Beijing newspaper explaining that many foreigners with double-barrelled names had been forced to buy new train tickets by over zealous ticket inspectors because the name on their passport did not exactly match the name on their ticket. I was grateful that I hadn’t further complicated matters by changing my name to David Knight-Croft the 1st. How monarchs ever get through Chinese immigration is a mystery. TOWARDS THE END of the flight to Xi’an, after the alarmingly sexual demonstration of how to inflate a life jacket, after the warm ham and cucumber rolls, after the stewardesses had collected our food wrappers and our drink cups, regardless of whether or not we’d finished them, they played a video of an older woman in an embroidered cardigan doing exercises. Cardigan lady stretched her arms out in front of her, and so did everyone on the flight; she rubbed her temples, and so did everyone else; she rubbed the bridge of her nose and all followed suit. It was like a giant game of Simon Says. I was the only person on our row not joining in and I felt pretty stupid. Such is the power of overbearing peer pressure, the fuel that seems to keep China going. 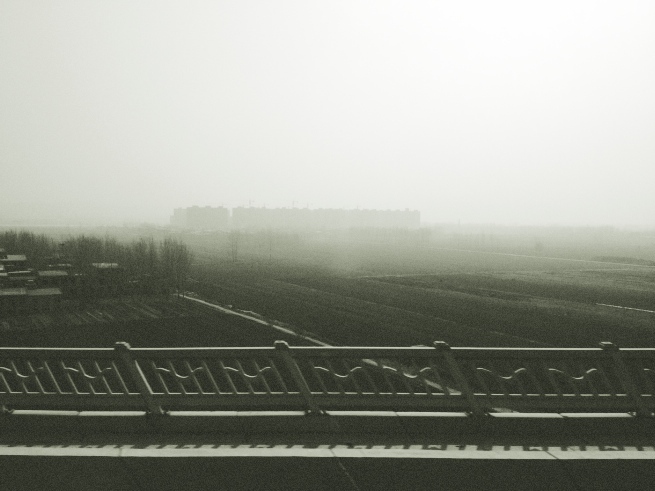 OUR INTRODUCTION TO the often bleak landscapes of northern China was on the bus into Xi’an from the airport. It was flat, with a dirty fog cutting off sight of the horizon. Giant tower blocks, half finished, all grey concrete and cranes, imposed themselves into the fog. Every so often there would be a towering brick chimney – the sort that you see everywhere in northern England, abandoned and dead – spewing smog into the dense air. I thought that it must have been what Lancashire and Yorkshire looked like in the 1800s. I saw a solitary man, sat hunched, fishing in a small pond by the side of the highway. The ground was scrubby around him, with little tufts of anaemic-looking grass, and the sun a pale disc of wan yellow above, struggling through the fog. He looked pretty lonely. But what do I know? He may have been having the time of his life. Further in towards the city, there were completed tower blocks in staggered rows, one after another after another, mute and identical. They disappeared off into the distance. China as glimpsed from the train. You’d be forgiven for thinking that I may have embellished this dystopian vision of hell, but I promise you – this is what it looked like. Perhaps it was the wrong time of year, or the weather was bad, or it really was fog and not smog – but I’m not convinced. We caught the bullet train from Xi’an to Beijing and from Beijing to Shanghai, and all the way on both journeys it was like this – flat, bleak building sites flashing by before they were swallowed again by the smog. On the plus side, though, pollution does make for wonderful sunsets. 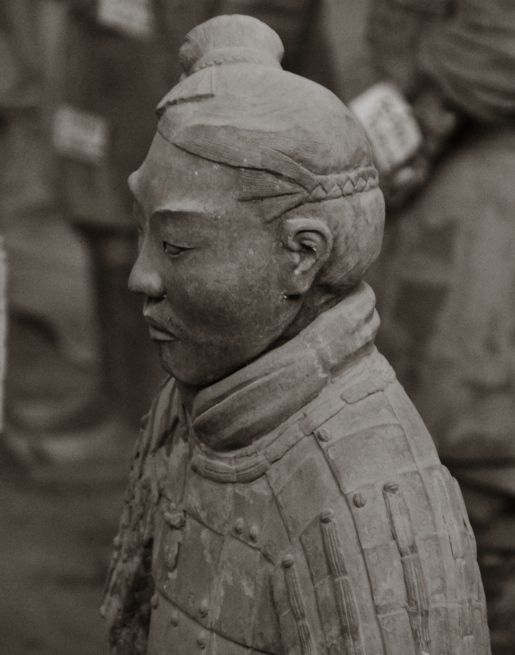 Xi’an is a wonderful place, with lots of history, lots of culture and many interesting things to see and do. I know this because I read it in the guide book. 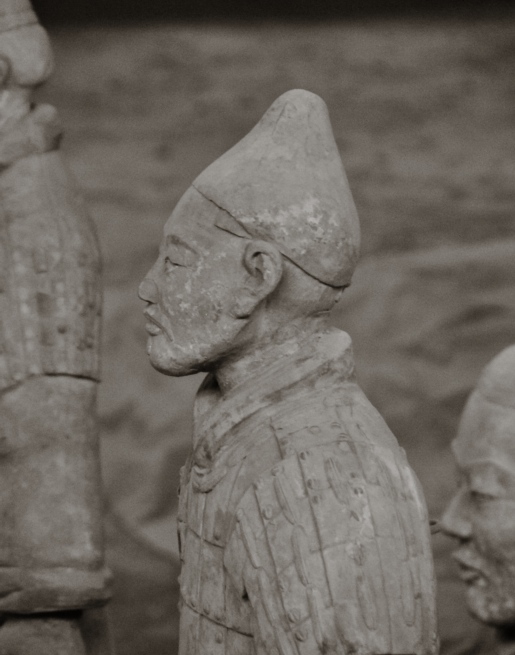 We experienced none of it – we were there for one reason only, and that was to see the terracotta warriors, about an hour or so outside the city. We were in the city for two nights, but didn’t leave the hostel in the evenings except to go to the convenience store over the road to buy instant noodles. 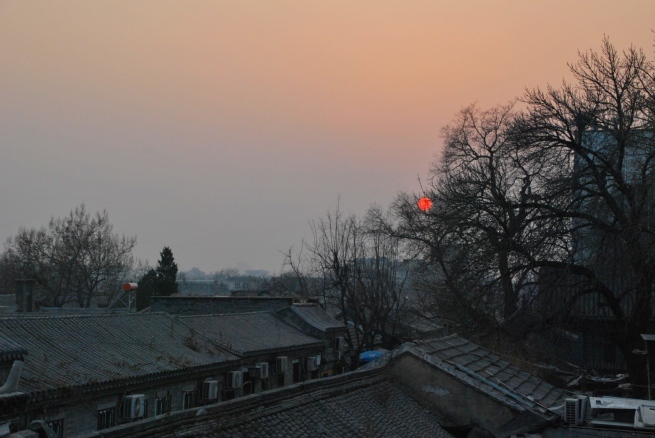 It was cold, and we had inadequate warm clothing, and the centre of Xi’an was busy and confusing; we had got lost for an hour (as usual) before finding the hostel, encumbered by our huge bags and the deadening of feeling in our outer extremities as the cold stole our heat. So we hid in our room, avoided other people and felt warm and safe and didn’t have a single regret about not seeing the rest of the city. And you know what? I’d do it again. 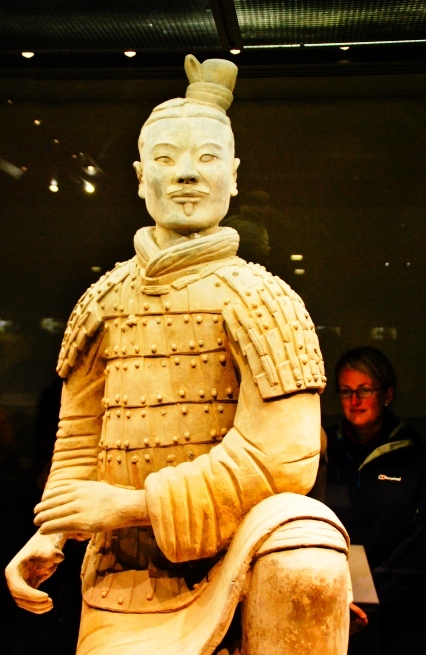 THE TERRACOTTA WARRIORS were worth travelling to Xi’an, and they were worth getting lost and cold in the city centre. 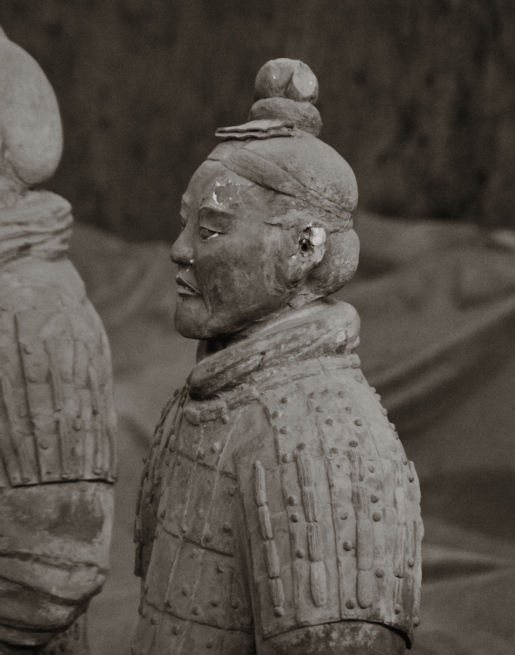 There are three warriors that you can see up close, behind glass screens, and they still hold some of their colour – and these are interesting to get close to (if you can shoulder your way past the crowds), just to feel that you’re near to something so detailed, so fragile and so old (about 2,300 years old). 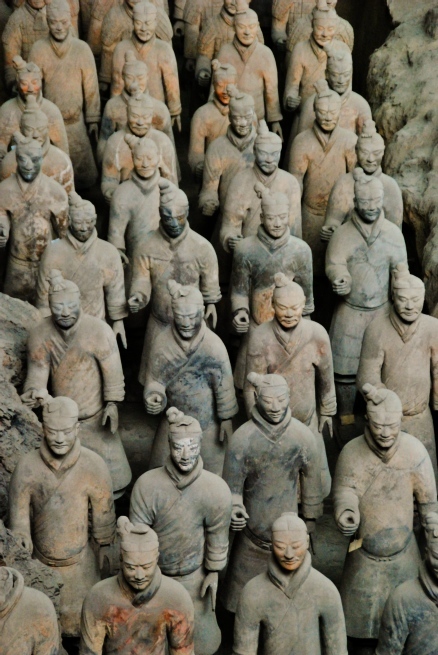 But for me, the really impressive bit is Pit 1, where they have excavated and reassembled hundreds of the warriors, and you can look down at them, all lined up like an army. Then you really appreciate the scale of the achievement. Later, in Burma, we met another traveller who claimed that the warriors in Pit 1 were all fakes. 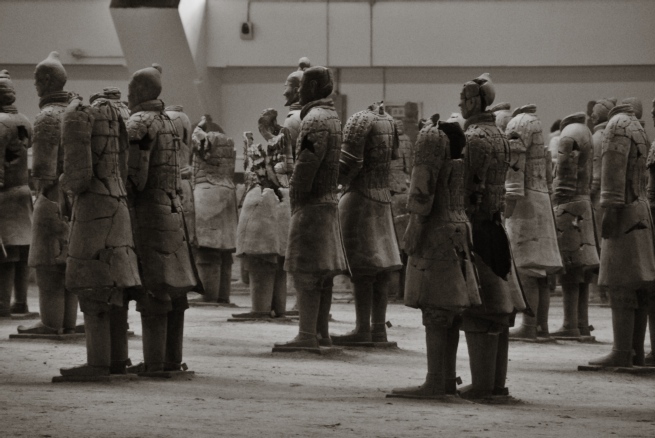 He knew someone who worked there, he said, (or perhaps a friend of a friend, I forget exactly) who had told him that all the warriors were smashed beyond repair except for three – why else did they have only three behind glass for you to look at up close? 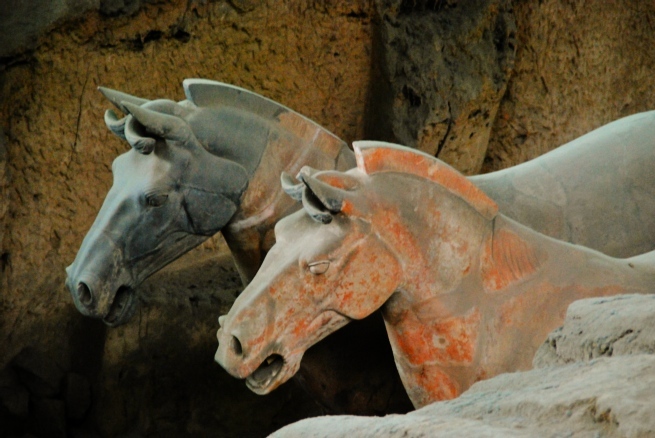 There are conspiracy theories on the internet that the whole site is one huge fraud by the Chinese Government, done to encourage tourism and to increase nationalism. These theories are far from credible. I hadn’t heard the alternate theory that only three of the warriors were real. I don’t believe it (think of all the international archaeologists that must have visited the site) – but a little part of me also wishes that I hadn’t heard it. I mean, when have you ever known the Chinese Government to be economical with the truth? 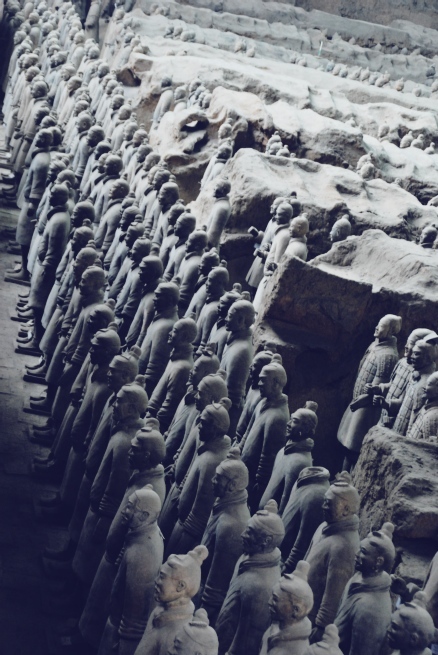 We visited the Terracotta Warriors on a small tour, organised through the hostel, and on that tour we met Dermot and his partner Jodie. They’d travelled (mostly) overland from London to China on the Trans Siberian Railway, and were three weeks into their big round the world tour, working their way to Australia. Their trip had gone swimmingly for a couple of days, until Dermot started to feel sick and had a bad stomach ache. This continued for three days, until they were forced to get off the train in Siberia and seek a hospital. It turned out to be appendicitis. You can read his account of how he lost his appendix while travelling the Trans Siberian Railway – including his stay in the less than sanitary Siberian hospital – here. 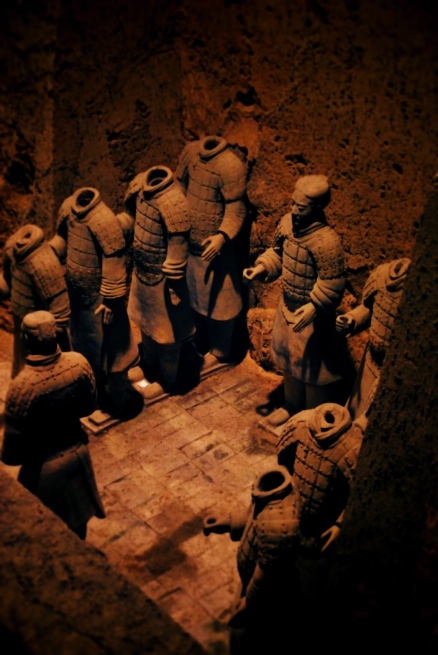 Suddenly, getting lost and cold in Xi’an didn’t seem that much of a hardship to visit the Warriors. So we left Xi’an with a renewed sense of purpose, a detailed account of the symptoms of appendicitis, and a cavalier attitude towards our own failure to go out and buy any more warm clothes. We were ready, in other words, for whatever Beijing could throw at us. 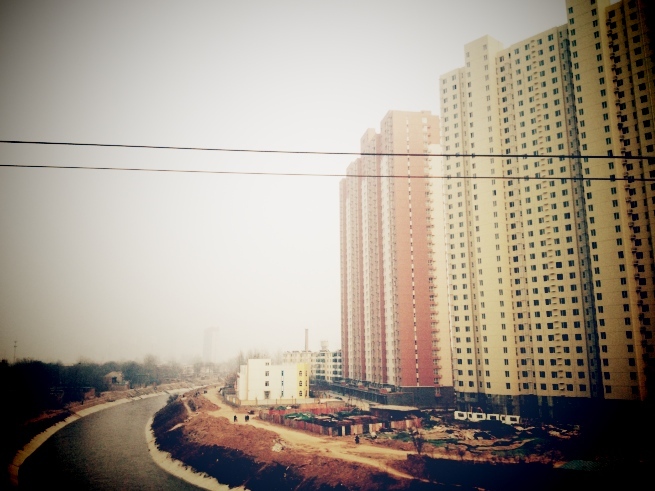 ON SATURDAY: Photoessay on Beijing and Shanghai. This post was written and uploaded in Kuala Lumpur, Malaysia. 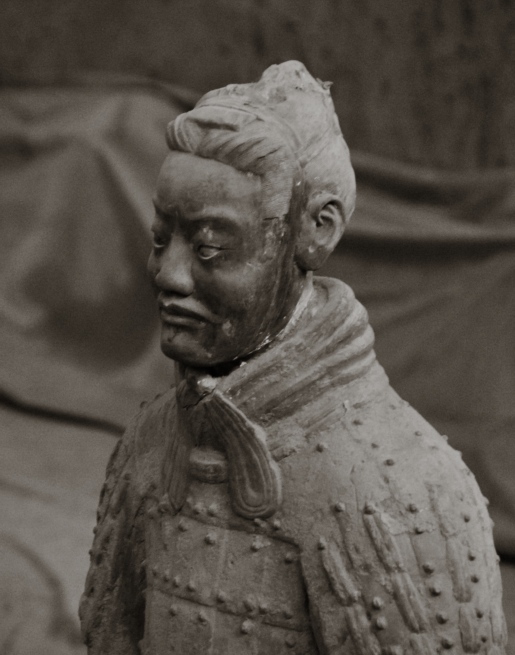 This entry was posted in East Asia, Travel and tagged China, Pollution, Terracotta, travel by elsewhereunderwritten. Bookmark the permalink.